We do shipping of your Studio Desk as quickly as possible and in regards to available stock. In case that some items are not in stock, we will inform you accordingly. Shipping is Free for all orders over 1.400 € within continental EU zone. Shipping prices for orders below 1400 € are covered during checkout. If your desired item is in stock we are going to organize shipping within 2 to ­3 business days from your order. If you place your order on the weekend, it will be sent out latest on Wednesday. All parcels are sent out by a tracked Freight door to door service. Your tracking number will be sent to you within 48 hours of your order being sent out. All goods are properly packed for delivery and optionally insured against delivery damages. We recommend checking your parcel before sign delivery. If any damage occurs please report immediately to our email. In case something is damaged, we can easily reclaim damage from the insurance company and replace your item. Our shop is updated most of the time with the available stock. If you are able to place some product into the cart, it is apparently in stock. If some product is available for “pre-order” and you pre-order it, it will be delivered after the product is restocked. Approximate dates are shown next to the product. If our cart showing “Sold out” this particular product is currently unavailable and we don’t have a date when it will be available again. Please note: The expected delivery times below are given to us by the shipping companies, occasionally parcels are delayed. Allow extra time for your order to arrive and check your tracking number before contacting us. To country’s of European Union parcels are sent by Freight door to door service tracked with tracking number on their website. Expected delivery time: 5 to 8 working days from the shipping date. Recently we expand our presence in the USA partnering with the local logistics company in Reading – Pennsylvania so we are able to service our US customers from available stock in the US warehouse. 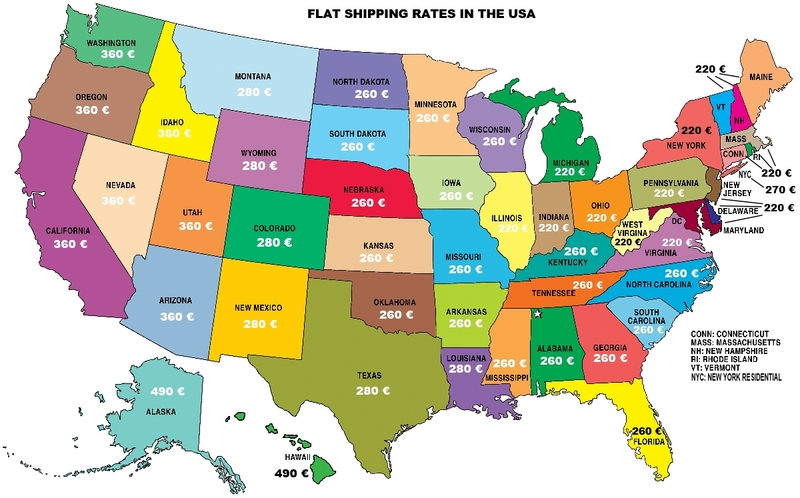 Flat shipping rates are calculated during checkout following the chart below. Shipping to Canada can be organized from the USA warehouse or from our EU facility on a flat rate – 490 €. Shipping including Door to door delivery including customs clearance fees and taxes. How long does it take for your order to be shipped? NOTE! Shippers are not obliged to deliver your goods into your garage or apartment. They are obliged though to deliver goods to the address stated during your order and as close as possible to the entrance of your building. Please note: The expected delivery times are given to us by the shipping company, occasionally parcels are delayed. Allow extra time for your order to arrive and check your tracking number before contacting us. Expected delivery time: 5 to 8 working days from the shipping date. 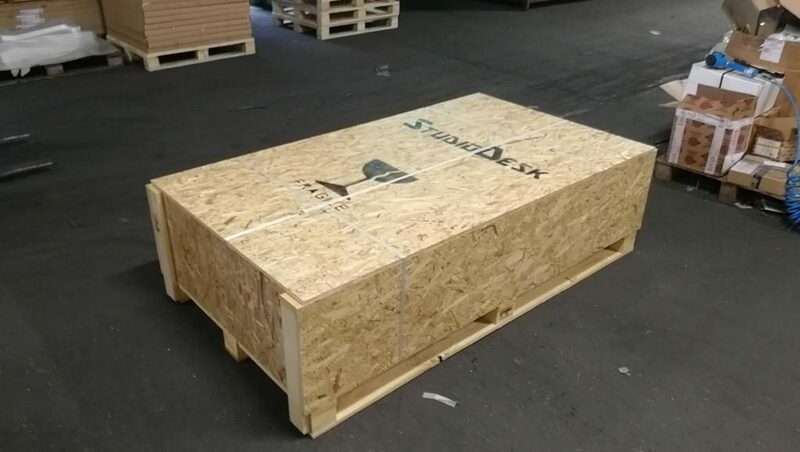 Our products internationally are shipped in collapsed form, packed in carton boxes and custom-made wooden crate on the pallet for maximum protection of your desk. NOTE! You will have to take care of the disposal of the wooden crate. We are able to ship to any international Airport in the world for self-pickup. If shipping to your country is not covered during checkout in our shopping cart, please contact us for a custom quote. All Shipments has to be customs cleared before pickup. Customs procedure can be organized through a chosen broker. Please note: International orders can be delayed because of customs clearance. Allow extra time for your order to arrive and check your tracking number before contacting us. Please be aware that customs procedures and clearance of goods and additional fees by your country may apply. If some item is out from stock in the US, we can offer to ship it from our EU facility. 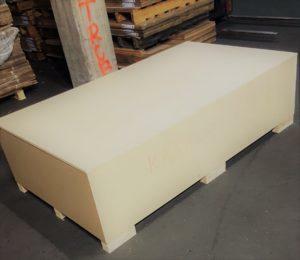 Shipping Flat rate is 490 € including door to door service, customs clearance all fees and local taxes. Returns and refund are considered only at the discretion of items purchased from Studio Desk furniture website and not his resellers. Only stock items will be considered for a refund (and then) only if they are received back at our warehouse within 14 days of purchase. All returns are subject to a 25% restocking fee. All return delivery, shipping, or postal charges are paid by the customer regardless of the size of the item. We will not accept items for a refund that have been damaged in any way. Every shipped package should be covered by strong insurance and will be replaced free of charge in case of damage caused by transport. If we receive an item within 14 days of purchase (and it is in the same condition as it was sold) refunds are promptly given*. There will be absolutely no refunds after 14 days of purchase. Should you refuse delivery of the goods in the good condition and as a consequence, we receive it back, a 25% restocking fee will be applied and the rest amount will be refunded to the customer. Delivery charges are not ­refundable. Store credit may be issued at the discretion of the Studio Desk website. 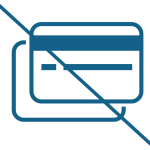 Credits will only be issued to the credit card used for the original purchase. Proof of purchase (receipt and/or invoice) is required for all returns. The value of missing accessories and any applicable open box fee will be deducted from the credit amount of the return. If a customer has not been charged for delivery (free delivery), its value will be deducted from the refund. Should you decide to return goods, please contact us at customerscare@studiodesk.net for the detailed information, where to ship goods back. NOTE! Goods are shipped with Freight services. Freight cannot be compared to Express service whatsoever. Delays can occur easily. Be wise and do not tear your studio down until you are sure about the date of delivery and shipper schedule your delivery with you. Nia d.o.o. StudioDesk can’t take responsibility for the customer’s losses caused by delayed delivery whatsoever. Customer, however, is fully covered to receive our goods in perfect condition and get a replacement for any missing or damaged parts in the package on our cost.